Springboard Excerpts | Read and Soar: Golfing with the Enlightened Dead - "What if you could play a round of golf with history's most provocative philosophers?" Leadership is midwifery. Pull what you can from individuals’ minds by asking questions. Individuals then become aware of their abilities to be engaged and to take pride in their work. (a Scottish euphemism for a death-by-water hazard). As they proceeded down the first hole, with Socrates eventually making the green after five shots (plus his 2 stroke penalty) and Bud landing safely on his second swing, he asked Socrates what it was like being the world’s most famous philosopher. “Actually, I always thought of myself more as a midwife of ideas,” was his reply. Bud, who was not trained in philosophy or in midwifery, pressed him for details; he was, as usual, more than happy to accommodate. Now personally, I believe that pure forms of knowledge of all things exist within us, though I know that this is not a terribly modern perspective. Nonetheless, I believe that they reside in our souls from birth. In other words, we have the capacity to know truth in all of its forms if only we are able to tap into our souls. This is obviously easier said than done because we often don’t know what questions to ask ourselves to get this information out to the conscious level – we need help to do this. Unfortunately, most of us never receive this kind of help; rather, we are told what to do, and how, when, and sometimes why to do it – our parents, teachers, coaches, and bosses leap in to guide and control so that we behave obediently and according to what society and organisations dictate. This is the “mind is a blank slate” notion made so popular about two thousand years after my death by two fellows named John Locke and Thomas Hobbes. They believed that we know nothing when we are born – we are not pregnant with ideas – and therefore we must have our minds filled by those who do know things. In contrast, I believe that the mind is not empty, but profoundly full of ideas waiting to emerge – waiting to be born. Whether or not you actually believe that the soul contains these truths isn’t the point; what is important is that we all have ideas. Many of them are profoundly practical and some are deeply philosophical, and the leader’s task is to help us bring these ideas to the light of day. For example, in one of Plato’s dialogues, the Meno1, he wrote about me having a conversation with an uneducated slave to demonstrate that we have innate, or inborn, knowledge. During this conversation, despite the fact that this fellow had had no formal training in geometry, he was able to arrive at Pythagoras’ theorem by responding to the questions I had carefully selected for him. What Plato was getting at here is that regardless of what hidden knowledge one is trying to extract from a pupil, if you ask the right questions, he or she will arrive at or give birth to the correct answer eventually and will feel empowered by doing so. The opposite approach, of course, would have been to tell the slave about the theorem and hope for a successful regurgitation, possibly with little or no understanding. Does this approach sound familiar – like contemporary teaching strategies used from kindergarten to university? As you can see then, my perspective is that the job of the philosopher is to act as a midwife, helping individuals to give birth to and become aware of ideas they already have so that those ideas can be used to live well. This simple process has been called the Socratic method of teaching. "This is truly a fascinating book. It makes the ideas of the great philosophers meaningful to everyday life. A remarkable achievement." "It's very accessible. Over nine holes of golf we are introduced to the ideas of some of the great thinkers and shown how we can all become applied philosophers, using these ideas to lead better lives. The world needs more applied philosophers!" "What if you could play a round of golf with history's most provocative philosophers? The Enlightened Dead gives us that opportunity and at the same time offers a practical guide to leadership. A great read for fans of golf, leadership and philosophy." "As an advertising entrepreneur, we are in the “winning ideas business” and this book offers meaningful insights from Socrates, Aristotle and other great minds to help give you a “competitive and meaningful advantage” in today’s business world. There is something for every business person." "Having followed the works of modern leadership theoreticians such as Frederick Herzberg, Douglas MacGregor, Tom Peters, Jim Collins and a slew of other notables, I was intrigued to learn that their theories reflected the thinking of the great philosophers. 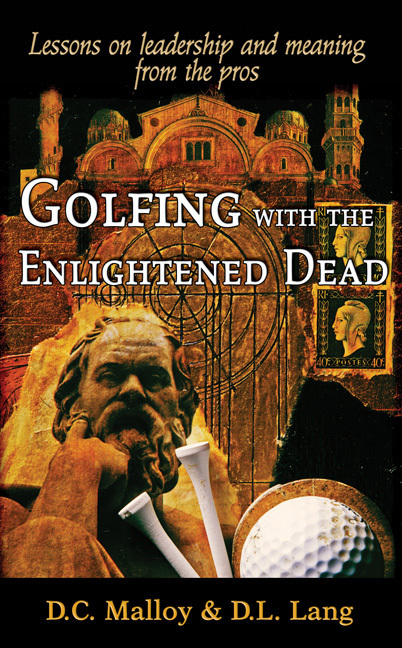 Play a round of golf with a few of these philosophers in "The Enlightened Dead" and learn the origin of foundational theories of organizational behaviour."